Ultraflex Systems is the digital media supplier that can meet all your wide-format digital print media needs. We’re the recognized leader in the industry and renowned for continually introducing innovative products, such as perforated window film, wall coverings, canvas materials, outdoor mesh fabric and more, to the market every year since we introduced Ultralon more than 25 years ago. With more than 60+ printable PVC and specialty substrate products in our products lines today, we’re the digital media supplier that can meet and exceed all your indoor and outdoor digital marketing, advertising and branding needs. Using an Ultraflex Systems’ outdoor mesh fabric, such as Strip Mesh Pro LTX, UltraMesh Premium 318 or UltraMesh Eclipse, for fence graphics, street banners, building wraps and/or other outdoor applications together with UltraVision Window Perf 60/40 is an excellent way to reinforce brand recognition. Our Mesh Banner Material Line includes a variety of economy to premium grade products with unique scrim patterns to meet nearly any need and budget requirement. 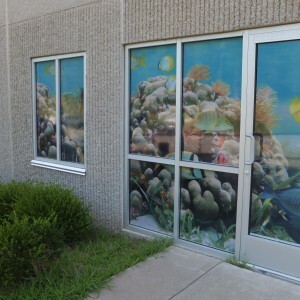 Contact a media specialist at Ultraflex Systems for more information and/or quotes on perforated window film or other wide-format digital printing media shipping daily to organizations in the US and other countries globally.